And that would be a shame since the wine is pretty darn tasty. With a slight smidge of sweetness, this almost completely dry Riesling has a flowery aroma, juicy and ripe apricots, pear, and plenty of food-friendly acidity. Finishes with a spritz of lime-y citrus. 13% alcohol also goes down easy. Occasion: Sample sent from the winery, tasted blind. 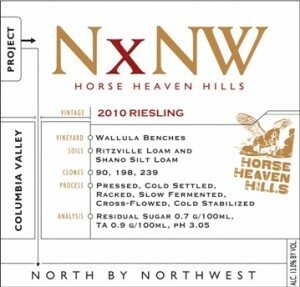 Availability: At fine wine shops and online at the North by Northwest website. Food pairing: Any Mediterranean dish with olives or challenging pairings like Asian or Indian food. The wine’s high acidity and slight sweetness combats the spiciness. Or try it with this Tilapia dish with fire roasted tomatoes.